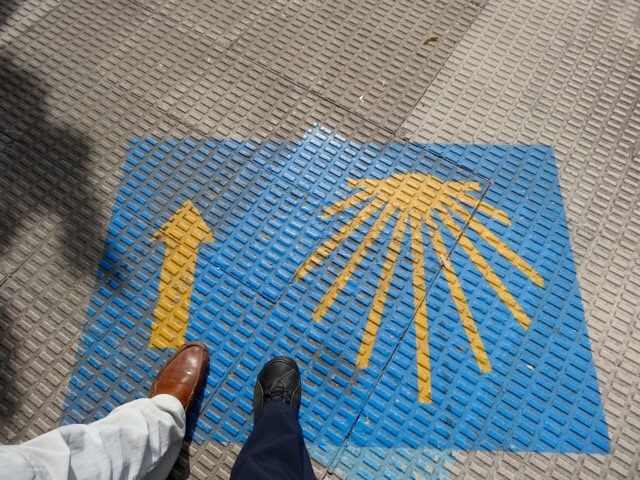 We walk four kilometers of the El Camino de Santiago ( a pilgrimage walk) on Thursday in Pamplona. I thought I would like to do a long walk like this, but after talking to some of the people on the walk I have changed my mind. 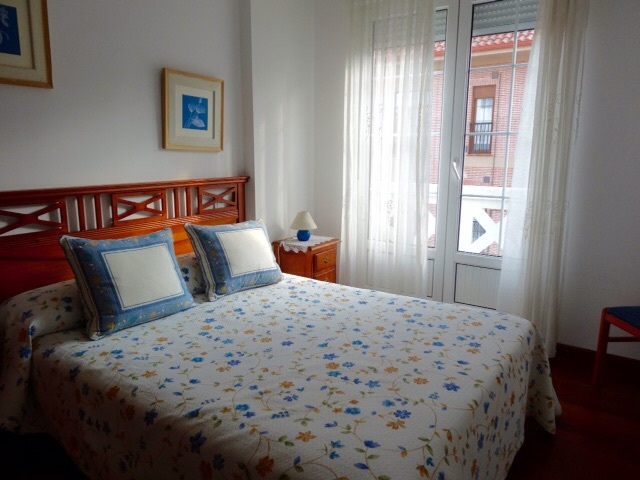 Much of the walk is on city streets or along the shoulders of roads, and the shelters are communal rooms with bunk beds very close to one another so lots of snoring and night-time noises. Not for me, thank you. 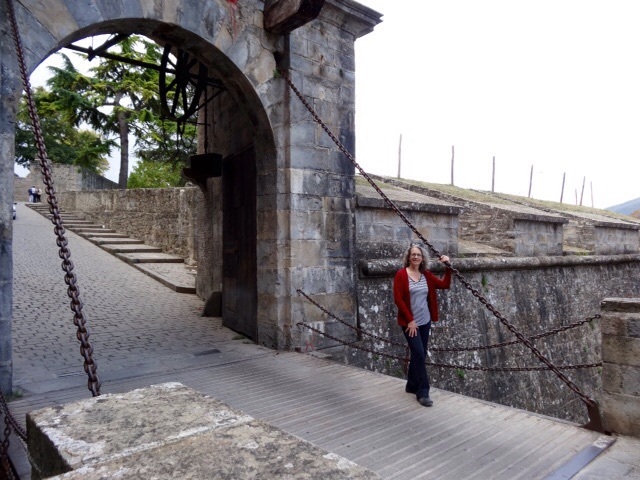 This is the Bridge of La Magdalena, a medieval bridge that millions of pilgrims have used to cross the River Arga on the way to Pamplona through the ‘Gateway of France’ which still has a working drawbridge. The drawbridge is now only used once a year on January 5th, when three Wise Men on camels enter the Old City of Pamplona. We follow the route of The Running of the Bulls, which takes place during the summer, all the way to the bullring. It is easy to imagine how crazy, chaotic and dangerous this event is. The streets are very narrow and there is nowhere to hide from the many very angry, very large stampeding bulls! 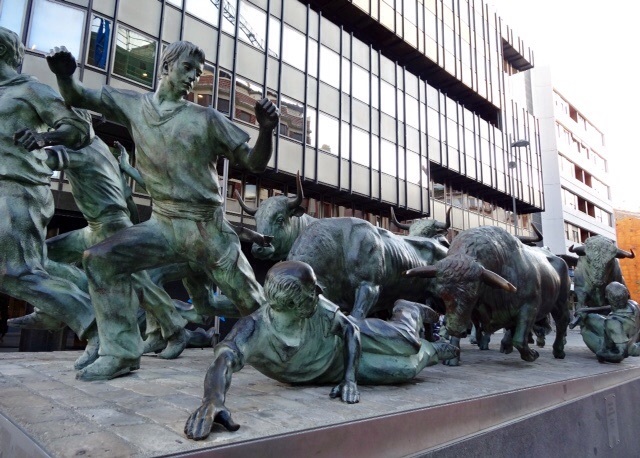 There is an eleven meter long sculpture called ‘Monument to the Bull Run’ by a Spanish Sculptor that faces the bullring. It is quite impressive and gives some idea of what this event might look like. 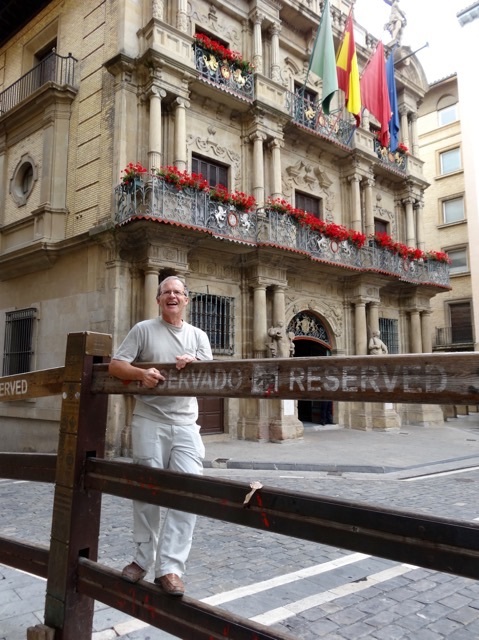 We rest for a while in the Plaza Del Castillo, with a view of the colorful buildings of Pamplona before getting something to eat and heading back to our hotel. We take a local bus that takes us almost to the door of our hotel. Nice, I am tired today. 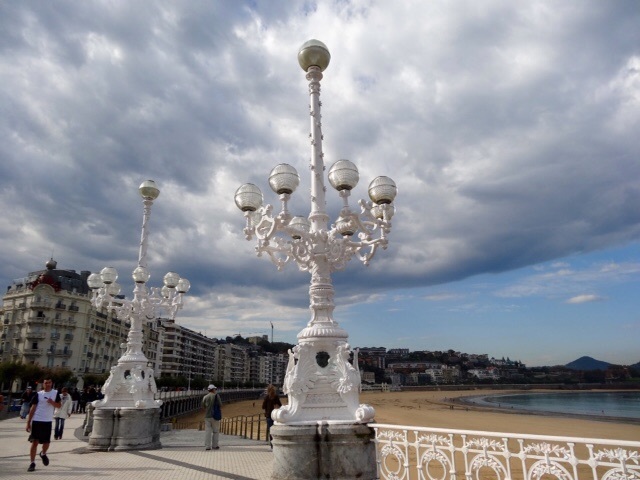 Wednesday morning we drive to the beach at San Sebastian, which is one of the popular resorts in Northern Spain. It is not for us. We prefer the more natural beaches, with fewer apartments and hotels. It is cloudy when we arrive but it warms up and the sun comes out. We have been very lucky with the weather, and had our first rain last night along with a very loud thunderstorm. I stick my fingers in the Atlantic Ocean which we have now seen from Florida, South Africa and Spain. 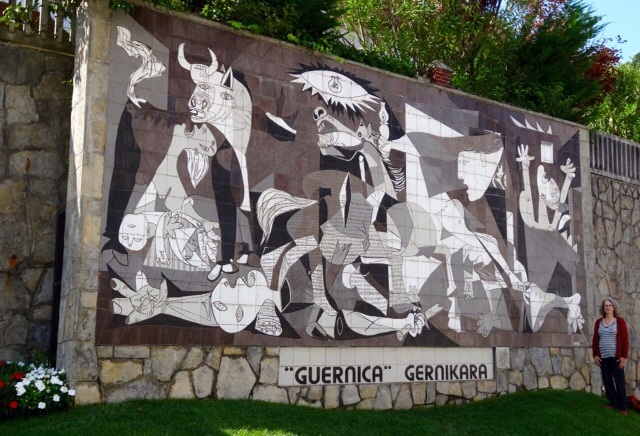 We are off to Guernica, a small town that was bombed by Germany in 1937 during the Spanish Civil War. It was the world’s first saturation bombing raid and the destruction this bombing caused inspired Pablo Picasso’s famous painting, Guernica. 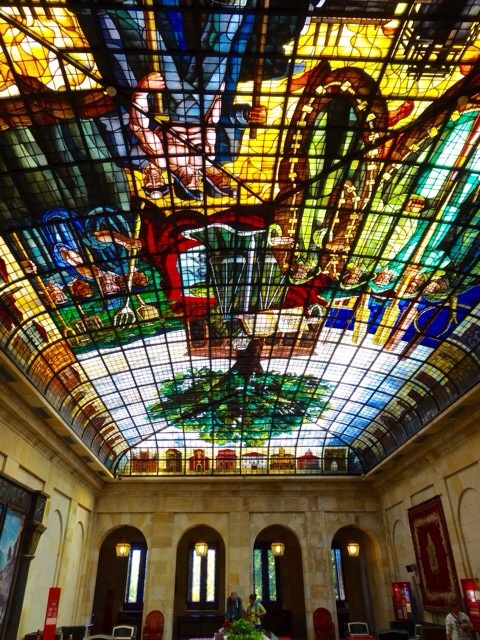 We first visit Guernica’s Parliament building, which has an enormous modern stained glass ceiling covering what used to be a courtyard. It depicts the Oak of Guernica. Basque leaders met in democratic assembly under this tree for centuries. There is a 300 year old petrified oak tree in the garden outside here which is symbolic of the ancient roots of the Basque people. 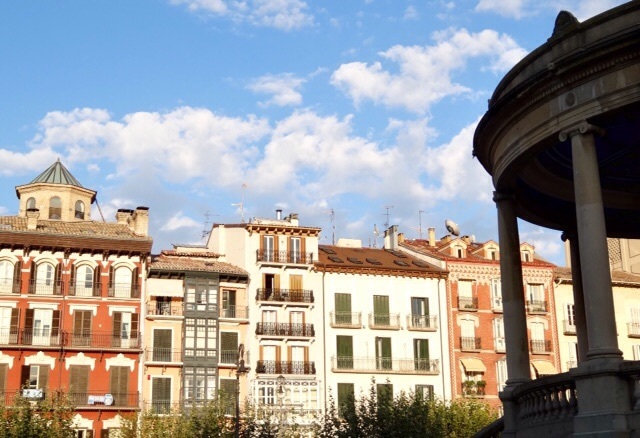 We find the tiled life sized mural of Guernica, the original paining is now in Madrid. 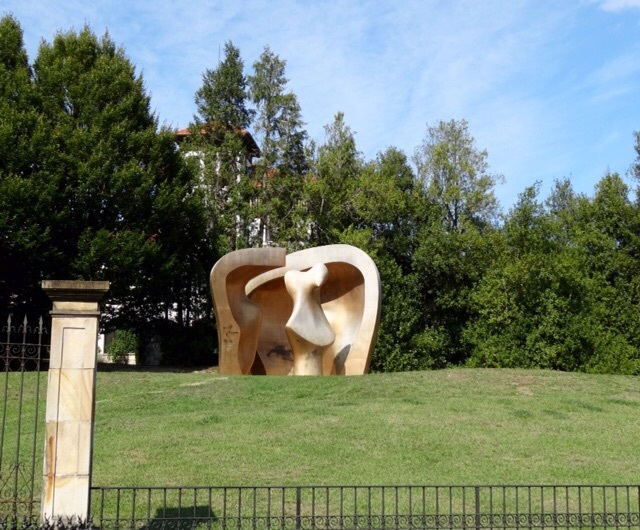 There are several large sculptures in the Peace Park adjacent to the Parliament building and the oak tree, including this one by Henry Moore. 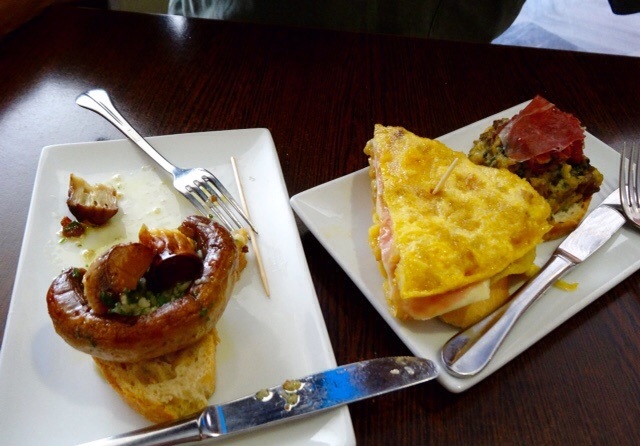 We had our first tapas in Guernica, an easy economical way to sample a variety of local foods. Perhaps the nicest part of the day was arriving at our Airbnb apartment in Gama. Our host Gemma met us nearby and we followed her to the loveliest little apartment. 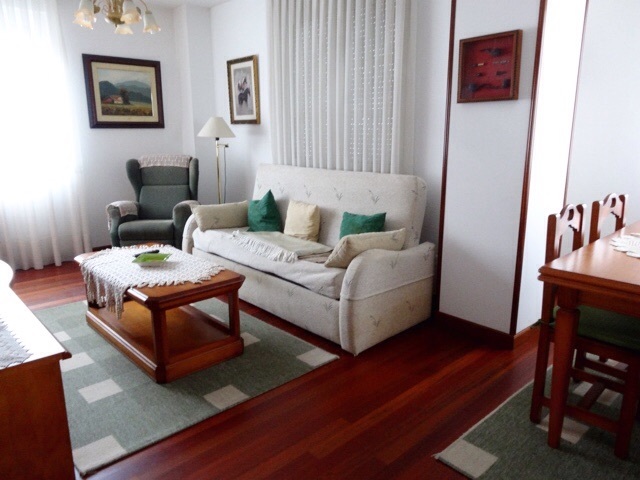 We have stayed at several Airbnb accomodations and this is the nicest one yet. We decide to extend our stay here to five nights. It is relaxing to stay put for a while and this is such a nice place to do that. Here are photos of our home for the next five days. 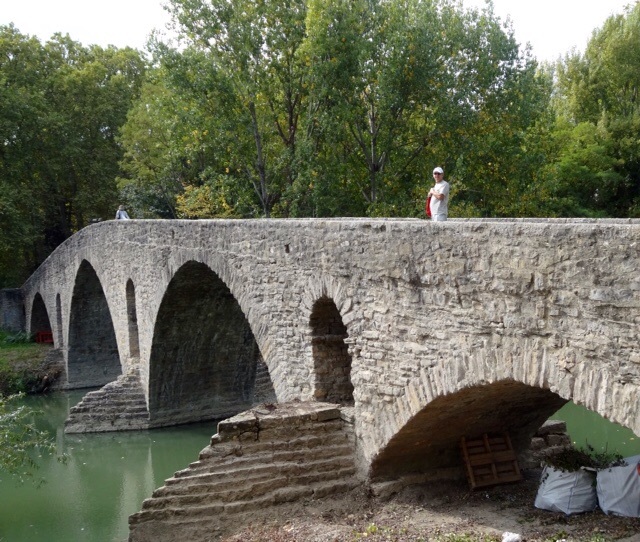 This entry was posted in Artists, El Camino de Santiago, Festivals, Gama, Guernica, Historic Buildings, Pamplona, Picasso, Spain and tagged Beaches, Bridges, Sculptures, Spain, Vacation by Trudy. Bookmark the permalink. Hi Gina, We definitely will have to chat when I get home. 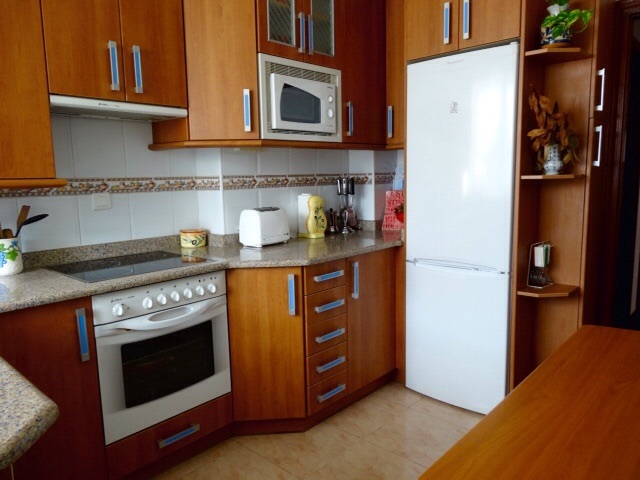 In the meantime, check out Airbnb. Atlantic Ocean from 3 continents…wow! I really loved the stained glass. Your B&B looks comfortable..hope it’s quiet so you can rest. I know, it is hard to believe how much travelling we have done in the last ten years or so. Hi mom. I see why you decided to extend your stay here. It is a beautiful little place. Lover the photos. Sad story of the bombing of Guernika isn’t it? The destruciton was worse than simply the loss of human life–it was the uprooting (literally) of a people. The tree was so much more than just its trunk, it was a symbol of a people, a history, a community, one which the Monarchy wanted to stamp out. Glad to see people appreciating this hidden gem. My sense is that many people know the Picasso painting, but few know the story behind the story of Guernika. Very sad. I agree that many people probably don’t really know the story behind Guernica. It is such a powerful painting when seen in person. 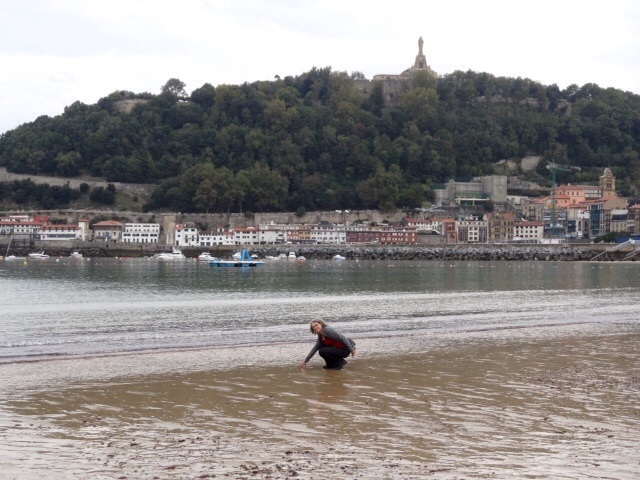 We are contemplating doing some if el caminofrom San Sebastián. 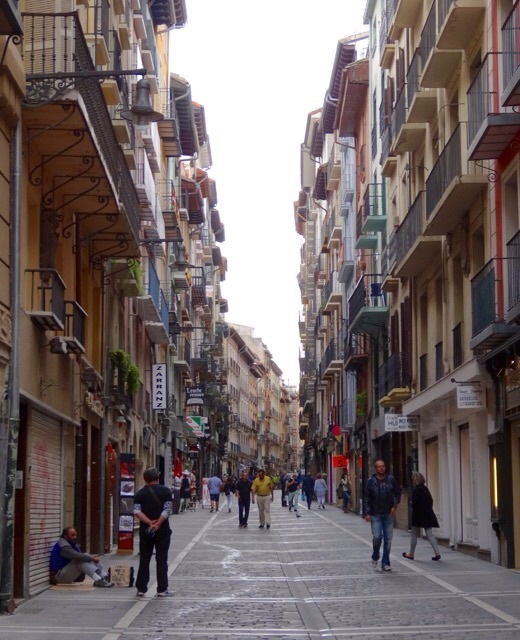 We have 7 nights and must return to San Sebastián on the last day. We are in good shape but in our 60’s… did you drive to your destinations or? Hello Paulina, We only walked bits of the El Camino when we happened to be nearby during our travels. The paths weren’t difficult where we were, often we were walking through town on a sidewalk. We didn’t have to organize getting back to our car because we always made a circular route, including other site seeing so that we ended up back at our vehicle at the end of the day.